I'm having trouble getting my shims to fit back in on my axles that I bought from carquest. It appears that they are radius cut and the shims do not slide onto the axle facing and lay flat. Is there anything wrong with me taking the shims to a machine shop and have them carve out the very edge of the inside diameter? I also need shims that are smaller than what the Mercedes dealership offers. The minimum size they can give me is 1 mm but I need less than that, around 0.80. Can a machine shop fix this too? Member Stretch (formally called Army) had to do the same and a little more. You can remove some of inner ring on the spacer so that it slide over your aftermarket axle and fits flat against where it is supposed to but reusing the old spacer does not guarantee the thickness will work with the aftermarket axle. I remember someone had an issue were no spacer was the right thickness. They bought slightly thicker spacer and had it surface ground at a machine shop to the desired thickness. This is easy because they just throw the spacer on top of a magnetic chuck and turn on the electro magnet and the magnetism holds the spacer down while they surface grind it thinner. I am not sure I understand the below method to determine what thickness you need. "Post #23 “I called the dealer and found out that while they have a selection of spacer thicknesses they did not stock one thin enough to fit my GSP's. I measured the gap between the inner diff housing and the snap ring slot using a feeler gauge with the axle pushed all the way into the diff“.. I will probably go with rebooting old axles when the time comes. I am not sure at close to 80 yrs old that I want to do this myself. Local shop says they only replace axles. OE axles cost almost as much as car is worth! Meanwhile, the 3M 5200 sealant on my existing partly cracked boots is still holding up. What I found is you really need a Vice mounted on something solid so you can use both hands and apply your upper body weight to the job (I ended up using a cone type tool). Or have a helper to hang onto the Axel with one end on the ground and one end up. I think if the Mercedes dealer would do the boot replacement it would be the method in the Factory Service Manual not stretching the boot over the cans. There must be some shops somewhere that would change only the boots because I doubt if Astoria and Dorman who both sell pneumatic boot spreaders are only selling them to private parties. Dorman also sells Cones to do the boot changes. See attached pic. 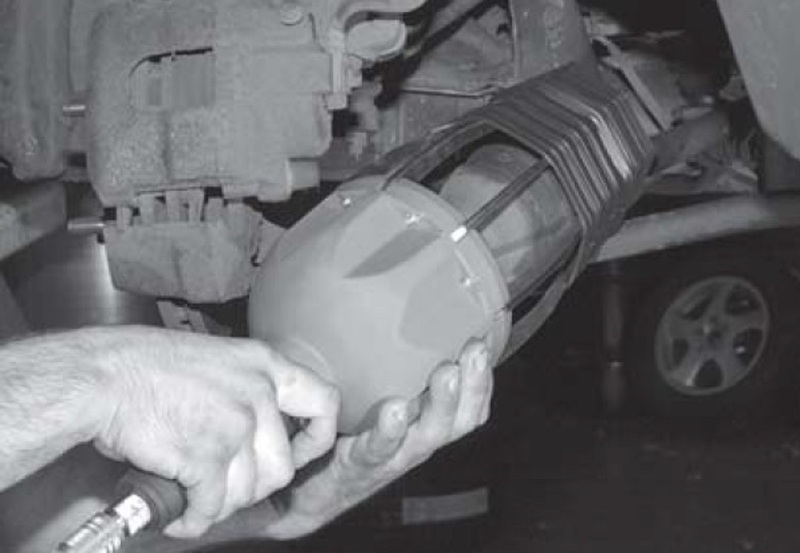 The other pic is a Dorman pneumatic boot spreader installing a boot while the axle is still on the vehicle. I recall someone posting here about problems with Dorman boots splitting during installation. No reports that I recall about problems with Astoria boots. That is, except for cost of tool. Maybe those boots could be used with a cone? There is one shop near me that said they may be able to re-boot. But they don't know the car and said to bring it in first to see if they can do it. I have a thread. The Dorman Pneumatic Boot Spreader does not seem to open quite enough to easily install boots on a W123. I used Dorman Boots. There is a more recent thread for the previous year where the Member said he kept splitting the Dorman Boots and he contacted Dorman. I never went back to that thread to see what Dorman had to Say about that. The Dorman Boots I got were from around 2014 and they did OK when I used the Cone Tool that I also had without using the Tongs that came with the cone. I don't know if Astoria boots would do better on the Doman Tool or you could use the Astoria Flexx Gun with Dorman Boots. Without knowing the answer from Doman I would go with the Astoria Boots except that I had bought 12 Doman Boots and still have a few left. Note that people have on rare occasions ripped the Astoria Boots. 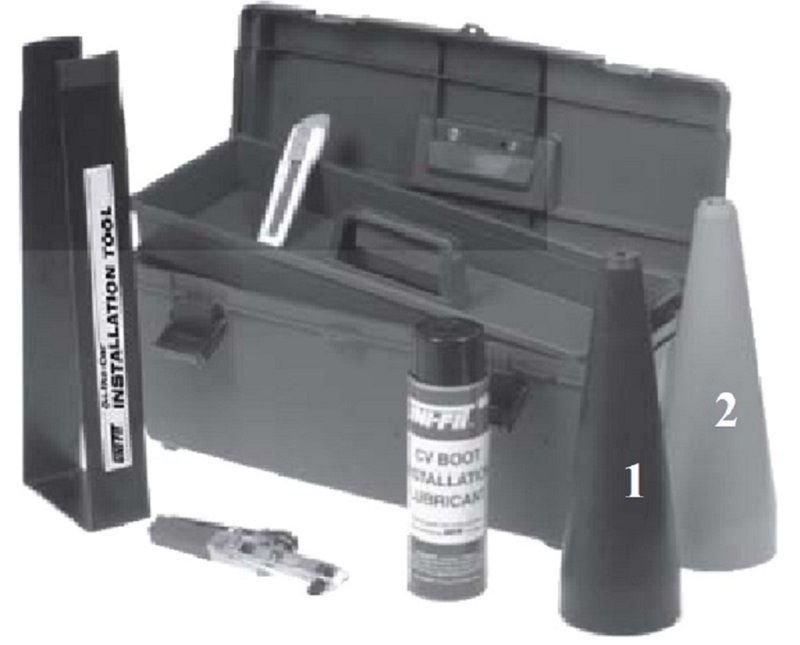 If you go to say Autozone as they only sell the Dorman Boot kit (boot+2 clamps+a grease packet that is insufficient for Mercedes w123 joints, you will need more greasd) and back in 2014 the were close to $15 each. Buy buying 12 boots the cost went down to $8 per boot and I did not have to worry about delaying the job if a boot ripped as I had others. Later I also used 4 of the Boots on my Chevy Cavalier. I can't comment on the Astoria Boots but more people have used them then the Dorman boots so there is threads on that.